Having followed in the footsteps of an imaginary visitor to London, first walking from west to east along Cheapside, Cornhill and Leadenhall Street; and then from east to west along the Thames; the final stage in our exploration of the old walled city takes us north and east along the course of the Roman and Medieval walls. A street named Saint Martin's Le Grand runs north from Saint Paul's Cathedral towards the spot now occupied by the Museum of London, but where Aldersgate once stood, and beyond it the road north through Finchley and Barnet to Huntingdon, Leeds, York, Durham and Edinburgh (the current A1 which, thanks to the 18th Century turnpike trusts, became more important than the older Ermine Street - now the A10, extending north from Bishopsgate). 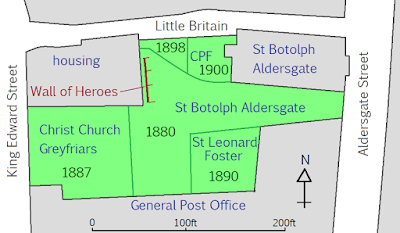 Aldersgate in 1670 (image is in the Public Domain). Saint Martin's Le Grand is named for a church that has long-since vanished, originally established, perhaps as early as the 8th Century, and certainly expanded in the 11th Century by Ingebrian, Earl of Essex, and Girard, his brother. Nothing of the church is visible today, but fragments were revealed during building works in 1815. It was an important place of sanctuary, and criminals being conveyed from Newgate to execution at Tower Hill would sometimes try to give their guards the slip at the top of Newgate Hill, in order to reach its gate. 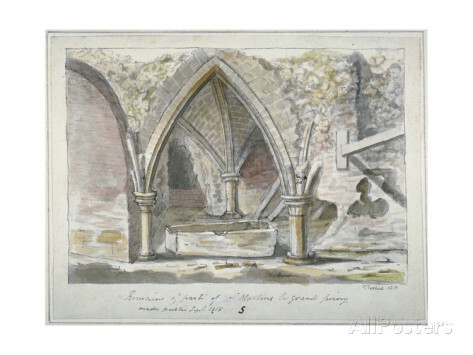 The crypt of Saint Martin's Le Grand, as revealed by building works in 1815, Thomas Prallent (image is in the Public Domain). After the dissolution of the monasteries, a number of coaching inns were established along the road, and these became focal points for the postal service, connecting London with the rest of the country. In 1836, twenty-seven mail coaches left London every evening, punctually at 8.00 PM, covering, between them, 5500 miles. Saint Martin's Le Grand in 1760 (image is in the Public Domain). The "Bull and Mouth" coaching inn in 1820 (image is in the Public Domain). A new state-of-the-art General Post Office was opened on Saint Martin's Le Grand in 1874. A contemporary account provides insights into its operations: "The basement is partly occupied as office-rooms, partly for stores, and partly by the department of the telegraph engineers, the large room in the centre being used as a batteryroom. The ground floor is appropriated to the Postmaster-General and the Accountant-General. On the first floor are accommodated the secretaries and their staff; the third and fourth floors being appropriated to the telegraph department. The fourth floor is especially devoted to the telegraph instruments, and the pneumatic tubes are laid on to it, establishing communication with the district offices." 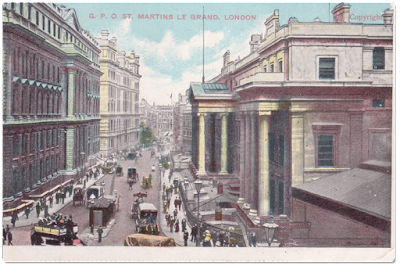 Saint Martin's Le Grand, with the General Post Office, in the late Nineteenth Century (image is in the Public Domain). Unsurprisingly, mail coaches and coaching inns were, by this stage, redundant, their place taken by railway carriages and train stations. There was even an underground, pneumatic railway, carrying mail between the General Post Office and Euston Station, although this was never economically viable, and functioned only for a few years. 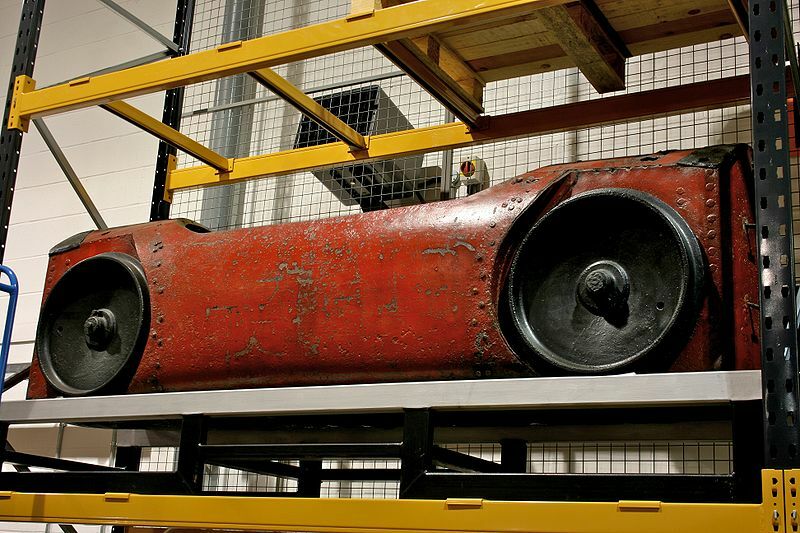 A carriage from the pneumatic railway connecting the General Post office to Euston Station, National Postal Museum. Photo: Mike Fell (licensed under CCA). The new communications technologies created work for women, as well as men. "In the telegraph department in the new wing," one account tells us, "young ladies are seated at the long rows of tables crossing the room from end to end, and, with few exceptions, each one has before her a single needle or printing instrument, the 'circuit,' or place with which it is in communication, being denoted on a square tablet, something like a headstone in a cemetery, erected immediately in front of her. It may further be remarked of these young ladies, that they talk much less than might be expected, work very quickly, and have generally very nice hands." 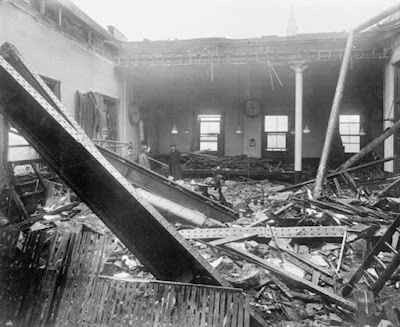 The Post Office building was badly damaged in a German air-raid in 1917, and all that remains today of all the communications activity that once took place around this part of London is "Postman's Park," where perhaps some of the postmen from the sorting office held lunch-time liaisons with the young ladies from the telegraph department. Bomb damage at the General Post Office, 1917. Photo: Imperial War Museum HO80 (non-commercial license). 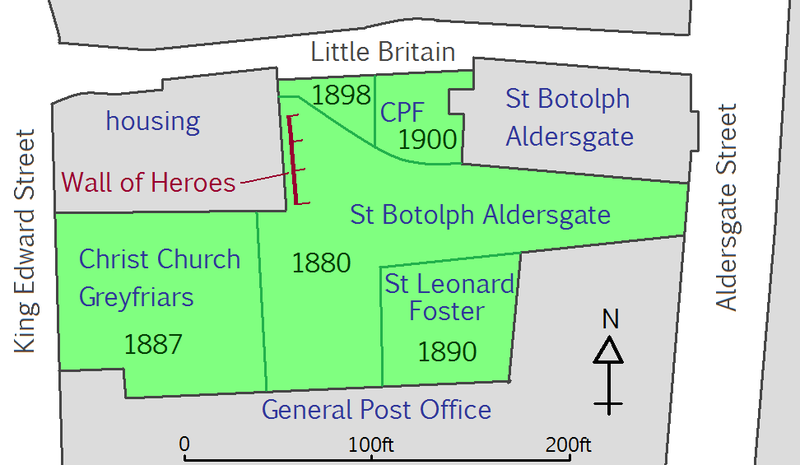 Postman's Park, based on a map of 1896, Guildhall Library MS 18911.Image: Iridescent (licensed under CCA). The park itself had been created from four former graveyards, after human remains from most of the city burial grounds had been cleared away to municipal cemeteries in the second half of the Nineteenth Century. 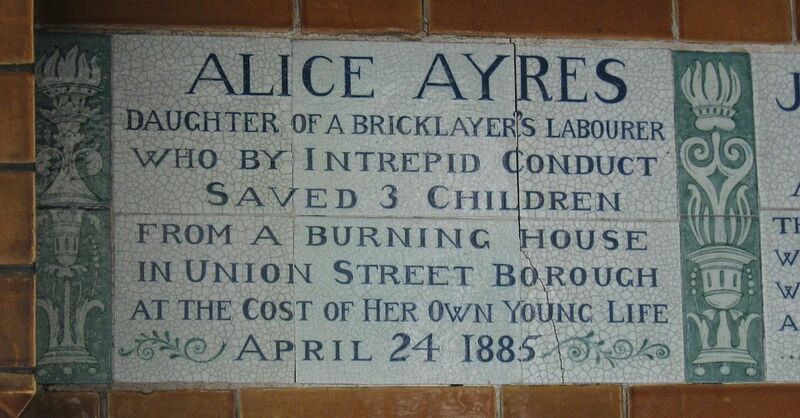 Postman's Park remains a place where city workers can enjoy lunch-time liaisons, and, through the efforts of the Victorian artist and philanthropist, George Frederic Watts, it is also a place where the brave and selfless actions of London's otherwise unsung heroes and heroines are commemorated, each and every one of them a potential character in a historical novel or short story. 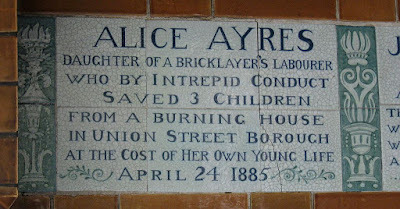 One of more than 150 memorial plaques in Postman's Park. Photo: Bazj (image is in the Public Domain).